Pain is a scary word. We all fear pain. Pain hurts. It’s physical. It throbs. It stings. It blurs the mind and makes it so that we can’t help ourselves from focusing on anything else but what ails us. Suffering hurts too. But suffering isn’t the same as pain. Suffering may be physical but it hurts beyond the body. Suffering affects how we think and what we expect and how we feel. There is no suffering scale from which to measure what you are enduring because what you are experiencing isn’t objective—it’s very personal. You can’t make your feelings of helplessness disappear. What you are experiencing as a caregiver can never be fully understood by outsiders, even if you knew how to communicate what you were feeling and experiencing on a daily basis. The person you care for is not the same person you remember. The person you love is experiencing something that you can’t necessarily take away—even when you would give almost anything to do so. No one will walk through the door and tell you that life will return to normal. No one can cure suffering. No one can make it go away. It’s a mixture of uncertainty and love and regret and anticipation and tenderness and dread. It simply defies comprehension and explanation. But the very deep vulnerability that brings us to tears at a second’s notice also turns our attention away from the future and back from the past, into the unfolding moment. It’s in the midst of suffering we know without a doubt that we need one another. Even though suffering is an intensely private experience, we know it retreats when we make human contact with another. When we hear the voice of a loved one. When we feel the touch of another’s hand. And when another’s familiar perfume or cologne washes over us in their presence. It is true that our care for another makes us vulnerable to suffering. But it’s even more true that what makes you so very special is that you care even in the midst of suffering. 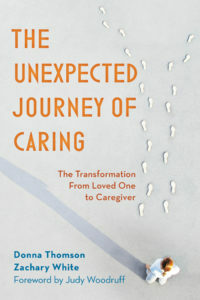 from → Caregiver Challenges, Different Kinds of Care, Feeling Unprepared? How do we cope with the guilt of being far away and not able to be there daily/weekly to help with a parent’s care/terminal illness?